When we head down to our local comic shops today, will there be any new Hawk-related merchandise waiting for us? Let's find out! Blackest Night Series 8 Indigo Tribe Atom -- Hawkman's buddy Ray Palmer spent a good portion of the back half of Blackest Night decked out in the duds of an Indigo Tribe member, using his great wells of compassion to help defeat Nekron. And now he joins your action figure shelf in the same such duds! Atom toys always amuse me because one can make the argument that they are 1:1 scale. This takes on a new light if you bring an Atom toy to a con with lots of girls dressed like Wonder Woman... aaaand with that I am going to stop this train of thought right there. From DC's The Source, we have a preview of Brightest Day #18. The stakes are really escalating as the end of BRIGHTEST DAY grows near. From Zamron to Central City, the pieces are all coming together. The White Lantern has a plan. There's several chilling lines in issue 18, on sale tomorrow, and we'll leave you with this one…. "Why are you aiming the ring at us?" I dig the cover, of course. Sounds like bad stuff is going down all through out the universe! Brightest Day #18 hits stores today. Image: Brightest Day #18, David Finch, 2011. Well, now that the storm is over let's check out the Hawkstuff, shall we? Brightest Day #18 -- I'll have a preview of this coming up in a bit, but we know that this issue catches up with our favorite Winged Wonders on Zamaron after Queen Shrike used her portal to teleport there. Remember that Geoff Johns said the Hawks were cursed... that can't be good right? DC Comics Presents The Atom #1 -- Collecting a pair of Atom stories, I might pick this one up just to read some adventures of Hawkman's #1 pal. 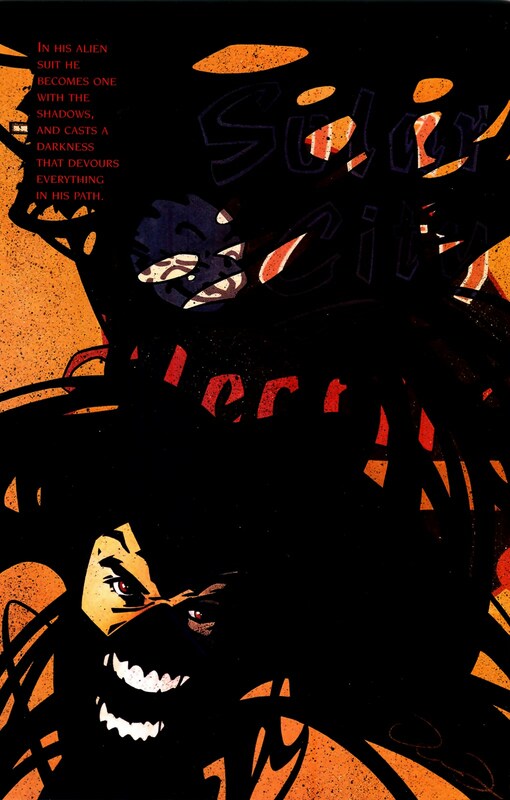 I am also intrigued by the big Atom special coming out collecting the rest of the co-feature... although I would have much preferred just to get the whole thing in a trade paperback. Unless DC intends to do that afterwards? Is that Lemire Atom even worth reading? Young Justice #0 -- I don't think they will play a large role in this, but the Hawks may pop up here. Today's sketch comes from the late Michael Turner, famous (or infamous if you prefer) for his prolific comic book babe artwork and his energetic, stylized superhero art. 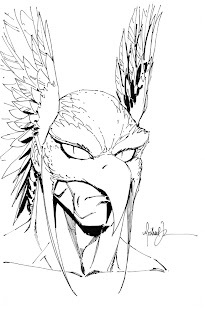 I wasn't always a fan of Turner's work (he had some amazing covers, but also some absolutely ridiculous ones), but the man could draw a sharp Hawk helmet, I must admit. And I must also admit that even if I didn't care for his work, he brought a passion to what he did which was evident on the page. Turner handled Hawkman on the Identity Crisis miniseries, where he was one of the major players. His art was even the inspiration for a DC Direct toy. I rather dug his depiction of the Winged Wonder, and this headshot is from that same school. The helmet looks spot-on, with the downturned beak and the long, ornate Honor Wings. I like the pursed, seemingly angry mouth as well as the tensed muscles evident in Carter's neck. Turner almost always had Hawkman's eye lenses look alien and inhuman, and that looks great here. All in all this is a very nice piece. 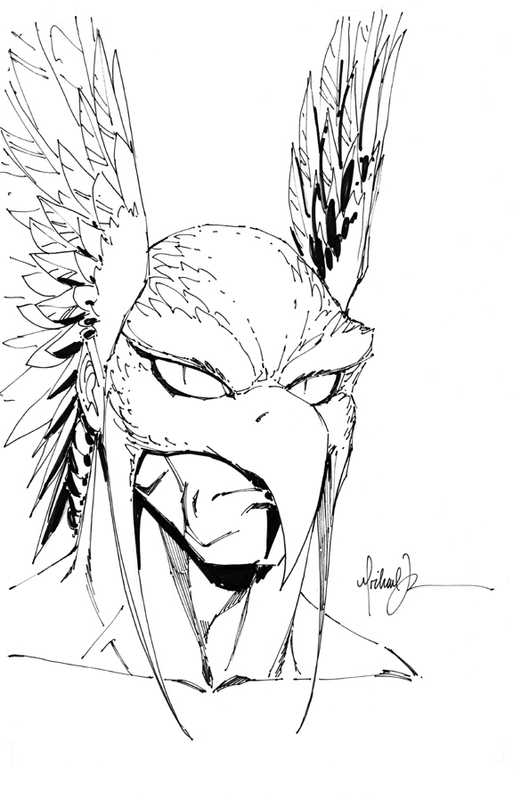 Image: Hawkman head sketch, ??? ?, Michael Turner, image retrieved from Comic Obsessions. Well, there does not appear to be anything Hawk-related for sale this week at your friendly neighborhood comic book shop, so instead we're going to take a look at some interesting items. Doom Patrol: Brotherhood -- Collecting issues #7-13 of the current series, this volume would be great to introduce someone to what Giffen and Clark are doing on the Doom Patrol. Following on the heels of the Blackest Night tie-in, the team not only has to deal with Thayer Jost's rival group the Front Men, but also a paradimensional construction crew, as well as Ambush Bug. The battle with the Front Men alone is worth the asking price, but beyond that this is a great showcase for the title. It's offbeat and more than a little strange, but this is the most accessible I have ever seen the Doom Patrol in my time as a comic book reader. I don't know how long DC will continue to support this mag, but so far it's been one heck of a ride. DC Direct Blackest Night Black Lantern Terra -- This toy pairs up nicely with the previously released DC Direct Geo-Force! Throw a Black Lightning and a custom Owlman in there and you are ready to go. Probably the only bone Outsiders fans will get out of this toyline, and I am willing to bet that this was item is more for Titans fans than Outsiders. I mean, who else are they going to get? Katana's kids? Things are slow going here today, as we are still in the middle of the deep freeze from the snowstorm yesterday. Everything is slush and ice now, which is a lot worse, frankly. But them's the breaks. I always liked the way Shayera was drawn in the DCAU style, including her earrings despite not being married. This image nicely demonstrates the problems a Hawk faces when not on patrol. The idea of Hawkgirl wearing a big backpack to hide her wing harness makes a lot of sense -- a lot more sense than the quickly abandoned shrinking uniforms and wings from the Silver Age, that's for sure. 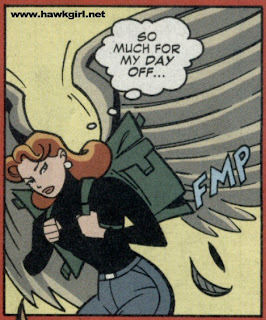 Also, the big backpack reminds me of how Angel had to hide his wings as an X-Terminator in the early days of X-Factor. Thanks to a solid 5" of snow, followed by some lovely sleet and freezing rain, my wife and I stayed home today with the little guy. So no post today -- hopefully things will get back to "normal" tomorrow. 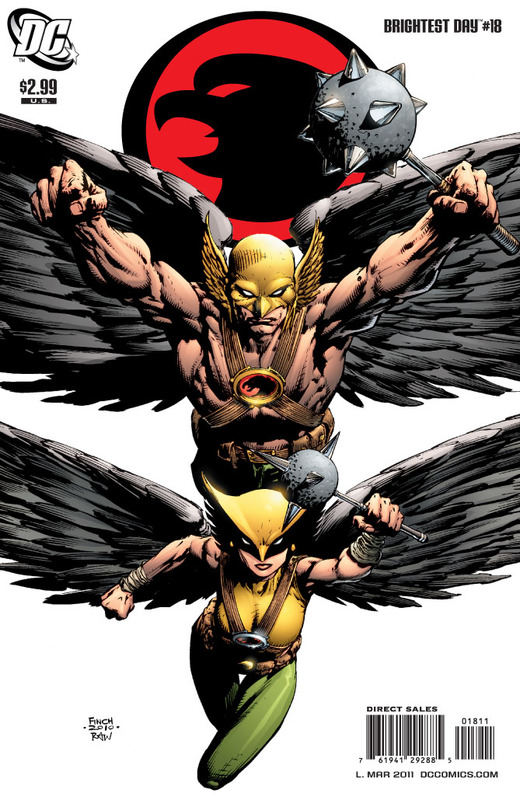 From DC's The Source blog, you can go here to check out a preview of Brightest Day #17, featuring Hawkman and Hawkgirl. I would post the cover but it has Firestorm on it, and you know how we feel about Firestorm on this blog. According to GL Editor Adam Schlagman, "Carol Ferris and the Star Sapphires join Hawkman and Hawkgirl in a fight for the survival of Zamaron and the purity of love, but with the Hawks' connection to the cosmic corps, it looks like this meeting may end in bloodshed." Brightest Day #17 is available today. Any new Hawk merchandise to start off 2011? Let's take a look! Brightest Day #17 -- Stay tuned, I'll have a preview of this issue up shortly. The format of Brightest Day has settled into switching between the stories to give each star a chance to shine. 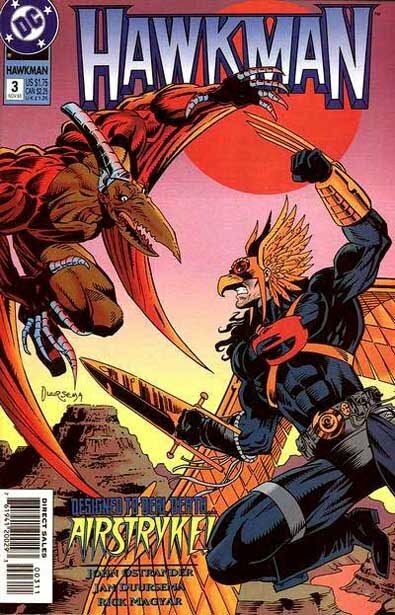 And this issue comes back around to the Hawks on Zamaron with Queen Shrike. This series more than any other is the one which drives me the most insane having to wait for each issue. Makes me feel like I am completely out of the loop. Oh well. That's the price you pay. 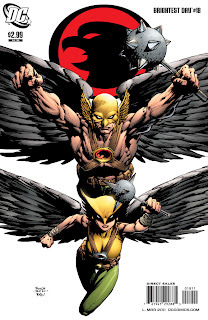 From the Amalgam Comics blockbuster (heh) JLX #1 comes this depiction of Angel-Hawk, the Amalgam equivalent of Hawkman and The Angel. Thanks go to rob! for posting this one. Hawkman and The Angel make for a logical combination of powers if not personality. How would such a combination act? I imagine "hot head" would still win out, but maybe with some arrogance mixed in as well. The costume, based on Angel's red and white uniform with some golden touches and helmet for Hawkman, looks very sharp. Angel's blue uniform would have worked as well. Note, though, that Angel-Hawk does not possess the Honor Wings! Huh! Makes me wonder if he is an alien with organic wings, or a hollow boned mutant with artificial wings? Image: Page from JLX #1 featuring Angel-Hawk, Howard Porter, 1996, image obtained from The Aquaman Shrine. Summary: In Chicago, Hawkman meets up with the Netherworlder shapeshifter Knowbuddy and his protection, Feralyce. Knowbuddy tells Hawkman the information he discovered while pretending to be Commissioner Emmet regarding Meta/Tech, and their chief researcher Dr. Moon. Hawkman wings off to find Moon, and demands information about Meta/Tech and the Marauder attack last issue. Moon is brash at first, saying that Hawkman wouldn't kill him, but some low altitude flying convinces him otherwise. Moon says that Meta/Tech has a research station at the Grand Canyon, and that something big is going on there. At the Grand Canyon, Hawkman begins to investigate the facility when the woman who really looks like Shayera Thal orders her genetically altered weapon Airstryke to attack. Airstryke not only can fly, but can transform himself into a half-human, half-pterandon creature. The Winged Wonder and Airstryke battle all over the skies, while "Shayera" keeps a close eye on things. When Airstryke begins to look for a fatal blow, Shayera orders him not to kill; Airstryke takes a shot at her in retaliation. As the fight rages on, "Shayera" disables Airstryke's powers, given Hawkman the opening to take him out of action. Hawkman spots "Shayera" and confronts her. The woman touches him and suddenly, he finds himself in the body of Shayera Thal! And now taking refuge in Katar's body is none other than Count Viper! Review: Airstryke? That's such an awesome name. Very much a product of the times. Beyond that, though, this is a straightforward little comic book. Hawkman gets information from an informant, fights a bad guy, then gets swerved by the Big Bad for a cliffhanger to the next issue. Badda bing badda boom. Ostrander's script is pretty pedestrian, but his dialogue works well. Airstryke would appear a handful more times in the DCU before Brother Blood put a bullet in his brain over in Outsiders. Mostly the star here is Jan Duursema's pencils, which, especially for a 1993 DC book, are very appealing to me. They look very dynamic and fluid, without most of the outlandish sort of eccentricities we normally associate with this time frame. Good little issue. Image: Hawkman v.3:no.3, 1993, Jan Duursema.